Although I left the city back in 2006 after living there for over 10 years first as a graduate student at Columbia University, and then as a career professional “trying to make it” in the city while acquiring professional experience at various architecture firms. You see…I feel like I know every part of NYC, and if I were to visit the city, I would be only as a guide to other tourists. I feel like I know every parts of NYC, and if I were to visit the city, I would be only as a guide to other tourists. With that conviction (while seeing my sister’s rolling eyes), I took out my old (10 years old!) Manhattan Subway map I carried around when I was a graduate student back in the 90’s. It was one of those maps you can only buy in NYC which was a small/foldable/ laminated / perfectly fit into the wallet I had at the time. With only seven days of the trip, it was decided that we were going to only spend time in Manhattan rather than venturing out to different boroughs. Manhattan is a walkable city…especially the hotel being situated at the central location such as Columbus Circle made this trip even more walkable for all us. The first day when we arrived at the hotel, all of us decided to explore the city by walking near the hotel and made a decision to check out interesting places we run into. Of course most “interesting places” turn out to be restaurants, desert places, etc….Without any directions in mind (that never happens to “true” New Yorkers! 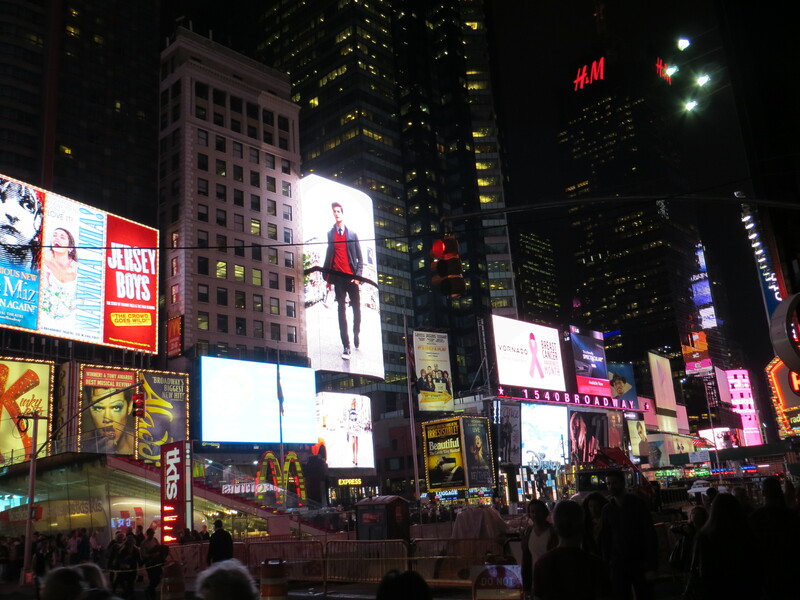 ), we decided to walk towards where lots of lights were as the day was getting darker, and ended up at the Times Square! It is the area I would never have walked TOWARD when I was living there years ago! It is the place to avoid, not pass through, only for the tourists!!! Well, I realized at that moment that I was the tourist, the tourist with the camera to capture every scene of Times Square. While pushing through the crowd, screaming and yelling to pass through, I had another thought….I don’t live here anymore. I am no longer the New Yorker who would ever entertain the idea of walking aimlessly or passing through the Time Square crowd to have the experience of NYC. I am no longer the New Yorker who would ever entertain the idea of walking aimlessly or passing through the Time Square crowd to have the experience of NYC. What’s your travel adventure like? Have you had a similar experience in the same city with different vibes of the place?